Editor’s Note: The following is an excerpt of a research report published last week, “Competing on Customer Experience: The Driving Force Behind Supply Chain Innovation.” The research, produced by Adelante SCM and presented by BluJay Solutions (a Talking Logistics sponsor), was conducted to explore the links between supply chain management innovation, customer experience, technology adoption, and company performance. You can read and download the full report at http://www.supplychainresearch.info/ . Is delivering an enhanced “Customer Experience” becoming a defined and measured objective within supply chain organizations? To gain insights on that question and more, Adelante SCM and BluJay Solutions conducted a web survey of supply chain and logistics professionals in March 2018. A total of 137 respondents completed the survey from Manufacturing, Retail, Logistics Service Provider, and other companies in the Americas, EMEA, and APAC. As part of the survey, we asked the respondents to rate their company’s supply chain performance relative to peers in their industry (ranging from “Significantly Below Average” to “Significantly Above Average”). We also asked them to characterize their company’s culture with regard to technology adoption (ranging from “Laggards” to “Innovators”). This enabled us to compare the responses between Above Average and Innovator companies with those from Below Average and Laggard companies. Overall, two-thirds (66.4%) of the respondents reported that delivering an enhanced customer experience is a defined and measured objective within their supply chain organizations. There are two ways to view these findings: You can either say it’s discouraging that many more companies aren’t incorporating customer experience within their supply chain performance metrics, especially as the “Amazon Effect” ripples across all industries, or you can say it’s encouraging that so many supply chain organizations are already focusing on customer experience because you had assumed the percentage would have been much lower. Delivering an enhanced customer experience, however, was notably higher among Innovator/Early Adopter and Above Average Performance companies (76.6% and 76.9%, respectively), and it was lower for Laggard/Late Majority and Average/Below Average Performance companies (51.2% and 51.5%, respectively). 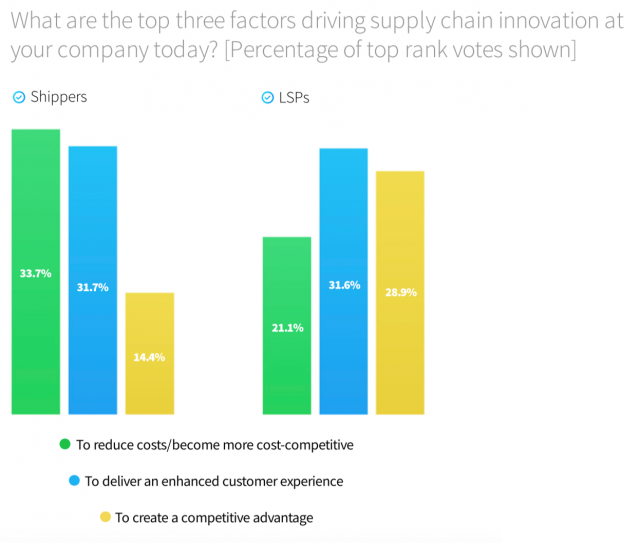 The results were similar with regards to which factors are driving supply chain innovation at companies today. Overall, “To reduce costs” and “To deliver an enhanced customer experience” received the same percentage of top rank votes (31.4%), with “To create a competitive advantage” placing third (17.5%). However, “To deliver an enhanced customer experience” received the most top rank votes from both Innovator/Early Adopter and Above Average Performance companies (36.2% and 37.2%, respectively). 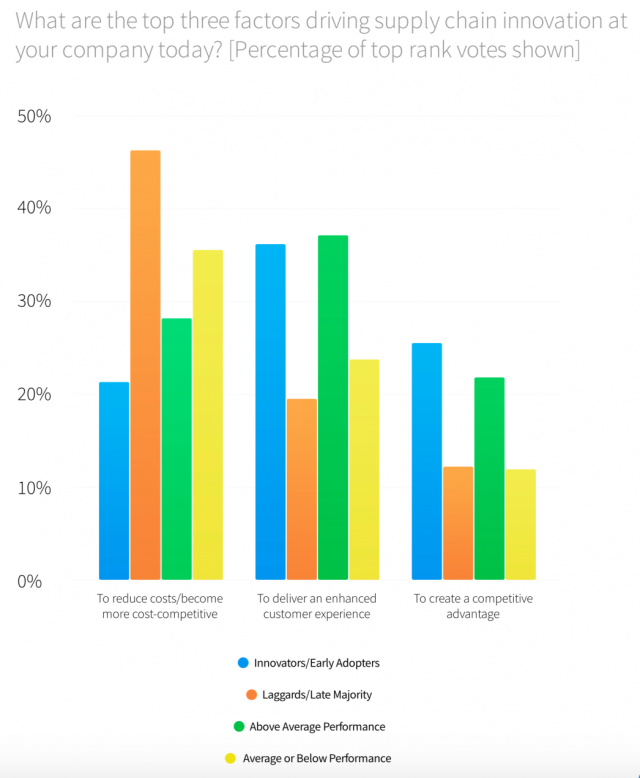 “To reduce costs” actually placed third for Innovator/Early Adopter companies (21.3%), behind “To create a competitive advantage” (25.5%). Simply put, when it comes to what’s driving supply chain innovation today, “cost reduction” is taking a backseat to “delivering an enhanced customer experience” for companies with above average supply chain performance and those that are innovators or early adopters of technology. It is also interesting to note the differences between Shippers (manufacturers, retailers, and distributors) and Logistics Service Providers (LSPs) with regards to innovation driving forces. For Shippers, “To reduce costs” received the greatest percentage of top rank votes (33.7%), but for LSPs, cost reduction actually placed third (21.1%), behind “To deliver an enhanced customer experience” (31.6%) and “To create a competitive advantage” (28.9%), which received far fewer top rank votes from Shippers (14.4%). At the BluJay Soar 2018 conference this past May, I conducted several video interviews with BluJay customers on the growing importance of customer experience. You can watch excerpts from the videos at the research website. Here are some highlights from my conversation with Brittany Neudeck from Bayer Consumer Health. What does supply chain innovation mean to you? What areas of supply chain and logistics are in the most need of innovation? Do you see outdated and fragmented IT systems as a hurdle to innovation? Is customer experience a supply chain metric at your company? What will define successful companies of tomorrow?